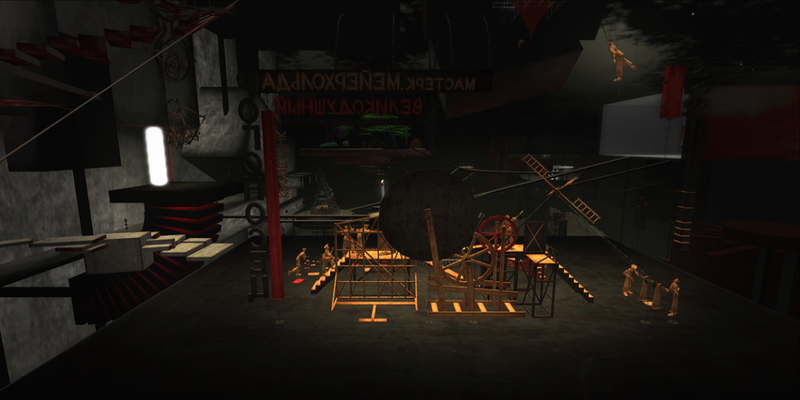 On Sunday the 27th of April at 1pm second life time, a collaborative Second Life work will open which is part of a larger exhibition being held in the main exhibition hall of Moscow’s Manege Museum. Peter Greenaway (UK) and Saskia Boddeke/Rose Borchovski (Holland) supported by the British Council have created a unique experience fusing a variety of visual forms. The virtual world exhibition is featured on four interactive viewing stations within the Museum and was created by Alpha Auer (Turkey), Bryn Oh (Canada), Caer Balogh (USA), Eupalinos Ugajin, Jo Ellsmere (USA), Nessuno Myoo (Italy) and Soror Nishi (UK). The virtual world region is provided by the Linden Endowment for the Arts. More than 1,000 artworks, borrowed from galleries and private collections around the world, are being displayed as part of the exhibit. The exhibition will spread across 5000 square metres. It will include polyscreen installations made with the help of the most up-to-date projection, light and sound equipment. It will represent a new approach to the history of art, combining film and painting, animation and 3D virtual world technology helping to create a unified atmospheric work, drawing the viewer into the space of Russian avant-garde. Constructivism was an artistic and architectural movement in Russia from 1914 to 1924 which dismissed "pure" art in favour of art used as an instrument for social purposes, namely, the construction of the socialist system. The term Construction Art was first used as a derisive term by the painter Kazimir Malevich to describe the work of artist/graphic designer Alexander Rodchenko in 1917, first appearing as a positive term in Naum Gabo's Realistic Manifesto of 1920. Kazimir Malevich also worked in the constructivist style, though he is better known for his earlier suprematism. Some other important artists and designers of the movement are El Lissitzky (art, architecture and graphic design), Sergei Eisenstein (cinema), Wassily Kandinsky (artist - painter), Valdimir Tatlin (artist/architect), Lyubov Popova (artist/stage designer), Alexander Vesnin (architect) and Varvara Stepanova (artist/designer). As a part of the early Soviet youth movement, the constructivists took an artistic outlook aimed to encompass cognitive, material activity, and the whole of spirituality of mankind. The artists tried to create art that would take the viewer out of the traditional setting and make them an active viewer of the artwork. Their output covered a wide range of both art and design, as well as architecture - ranging from theater, film and photography, from fashion design to graphic design, as well as to fine art such as painting and sculpture. Alongside involving themselves in designs for the fledgling Soviet industry, the Constructivists also worked on public festivals and street designs for the post-October revolution Bolshevik government. The constructivists tried to create works that would make the viewer an active participant of the artwork. This premise was tested in theatre, particularly through the work of Vsevolod Meyerhold, who had developed a 'biomechanical' acting style, which was influenced both by the circus and by the 'scientific management' theories of Frederick Winslow Taylor. Meanwhile the stage sets by the likes of Vesnin, Popova and Stepanova tested Constructivist spatial ideas in a public form. The movement was strongly fostered by the early Soviet regime, particularly by its leaders, Lenin and Trotsky. However, after Lenin's death in 1924 and Stalin's subsequent rise to office, Constructivism came to an end in the mid-1920s. Many Constructivist artists and designers were forced to emigrate from Russia under Stalin's rule, and those who remained had no choice but to succumb to his expectations of art and design as tool for his propaganda machine. Tatlin’s Tower, or the project for the Monument to the Third International (1919–20), was a design for a grand monumental building by the Russian artist and architect Vladimir Tatlin, that was never built. It was planned to be erected in Petrograd (now St. Petersburg) after the Bolshevik Revolution of 1917, as the headquarters and monument of the Comintern (the third international). 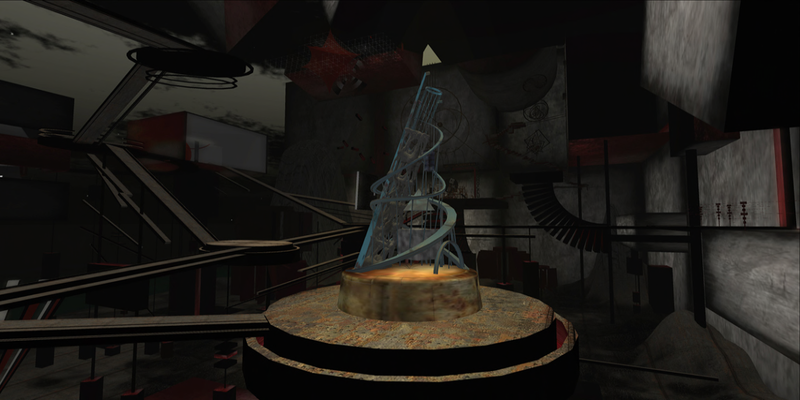 The tower was re-interpreted for SL by Bryn Oh. Read more here. 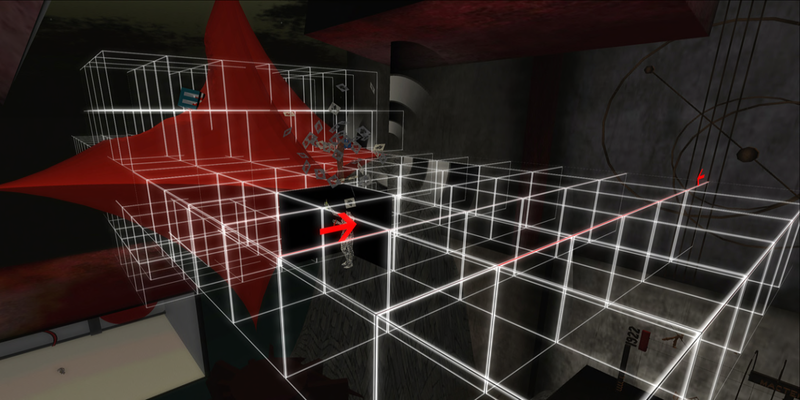 El Lissitzky's "Victory under the Sun" drama costumes were replicated fo SL by Alpha Auer. Read more here. The constructivist dramaturg Vsevolod Meyerhold was in search of a new kind of theatre; one that could widen its emotional potential to express new thoughts and ideas and reflect the times in which he was living. Meyerhold was primarily concerned with integrating the two dimensionality of set design with the three dimensionality of the actor’s body. It was a deliberate attempt to move away from the naturalistic presentation of theatre in which the set merely served as a backdrop to the actor’s text-based performance. Meyerhold was in search of a new kind of theatre; one that could widen its emotional potential to express new thoughts and ideas and reflect the times in which he was living. The stage which was designed for him by Lubov Popova has been replicated for SL by Nessuno Myoo. See more here. 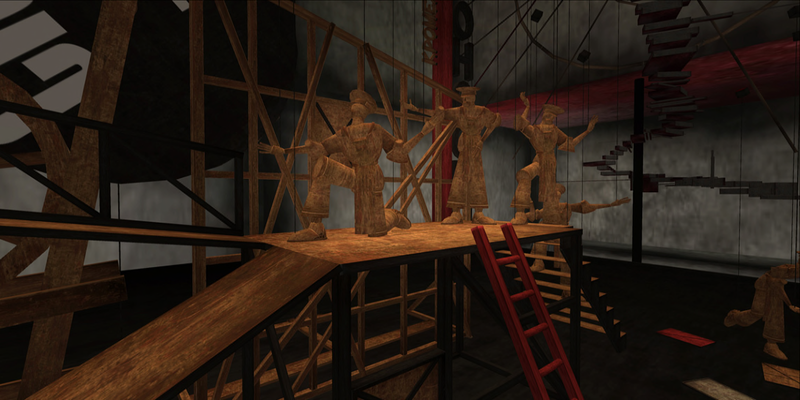 3 sculptures of Alexander Rodchenko's were replicated for SL by Nessuno Myoo. See more here. Biomechanics is a system of actor training introduced in the early 1920’s by legendary Russian actor, director, and teacher, Vsevolod Meyerhold. Through this training, Meyerhold sought to develop actors whose work would convey a geometric precision, an acrobatic lightness and agility, and a rhythmic, musical sensibility. 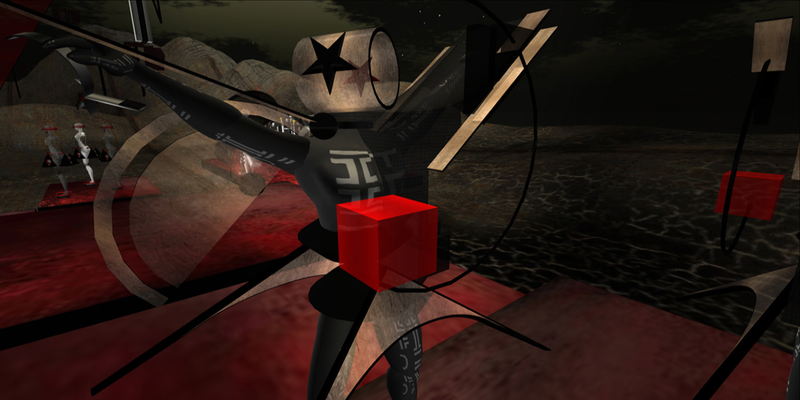 An expose of Meyerhold's biomechanical methodoloy has been brought to SL by Jo Ellsmere who has enlisted a corps de ballet of robotic avatars to perform a Meyerhold sequence within SL. Read more here. 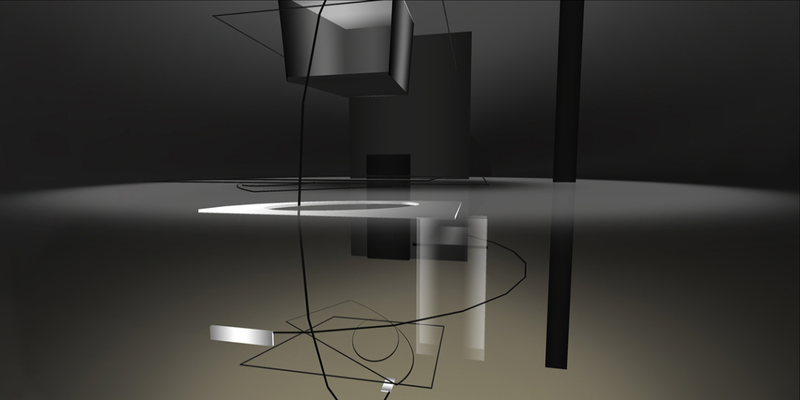 El Lissitzky's pround drawing #18 has been dimensionalized into 3D for SL by Alpha Auer. See the original drawings here. El Lissitzky's famed collaboration with poet Mayakovsky produced a concrete poetry work entitled "For the Voice" in 1923. The page spreads of this book were re-interpreted for SL by Alpha Auer. See the original spreads here. 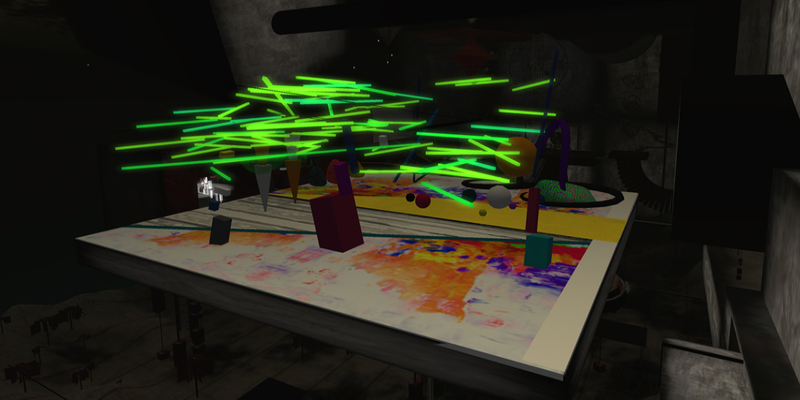 Soror Nishi has brought Wassily Kandinsky's world of abstractions into SL as garden of color and glow. Read/see more here. Eupalinos Ugajin's installation is based on the book "We" by Yevgeny Zamiatine, a book that by some has been considered to be the "father" of George Orwell's novel "1984" and Aldous Huxley's novel "Brave New World". Read more here. OPENING SUNDAY APRIL 27th AT 1 PM SLT! Very thorough post. Good stuff.